Ven. 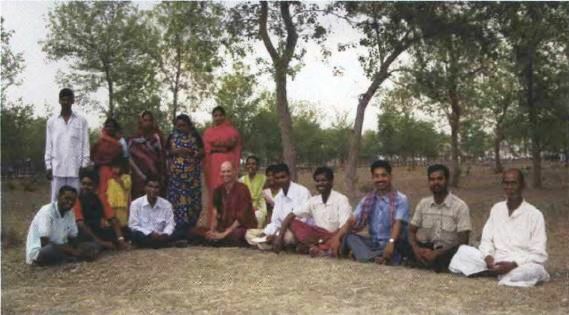 Kabir, center, with attentive villagers. It isn’t the way Lord Buddha traveled (I mean to say, sitting on an upper shelf of the luggage bogey, the very last, of the very crowded 10 A.M. Gaya to Dehri-On-Son passenger train), but that’s what fate allotted me on the 7th of April as I took the second leg of a little venture into the interior to meet some friendly villagers who had already attended some of our introductory Buddhist courses at Root Institute. It was a remarkably comfortable and convivial scene as the train headed west on the Benares line; and as I listened to the twang and lilt of the bhojpuri dialect, I reflected that it probably wasn’t too different from what the Buddha would have spoken to these fellow voyagers’ ancestors two and a half millennia ago. The subject was different, of course.